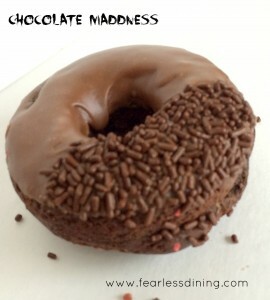 Home » Gluten Free Product Reviews » Baked Goods » Gluten Free Donuts Get the Psycho Treatment! 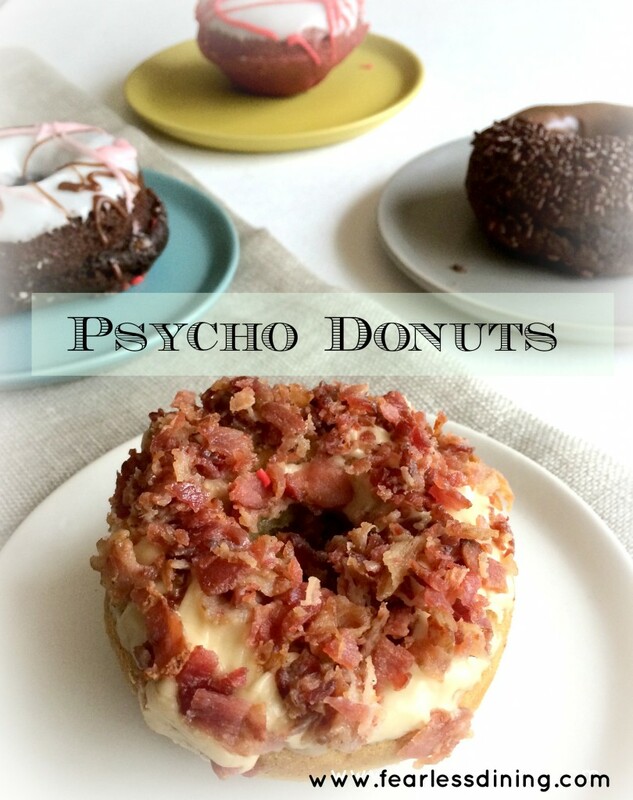 Psycho Donuts gluten free Friday! Every two weeks (skipping Valentine’s Day weekend) you can find some gluten free goodness in the shape of donuts. With names like The Sticky Pig, Chocolate Madness, Sochi’s Choice, and Psycho Strawberry Super Nova, how can one on a gluten free diet resist? The names of these donuts are as Psycho as their toppings suggest. Chocolate cake, vanilla icing, and strawberry drizzle. My family’s ultimate favorite!! Vanilla donut, maple icing, lots of crispy bacon! Chocolate donut, chocolate icing, and chocolate sprinkles. Naked donuts are made at Melinda’s Gluten Free Bakery in Santa Cruz. This is a dedicated gluten free facility. These donuts are placed in exclusive sealed containers and dropped off at Psycho Donuts by 10 pm Thursday night. Gluten free donuts are topped before regular production on a sterilized surface. Fresh icings are pulled and put in separate containers. There is no risk of cross contaminating the icings this way. Gluten free donuts are placed on gold trays lined with parchment paper. Gold trays are only for gluten free so staff can easily identify that they are gluten free. The next morning before opening. Gluten free donuts on gold trays are placed on the top row of the case so nothing can fall onto them. The bulk of the donuts remain in the zippered cart, and added to the case as needed. Gluten free donuts are placed on gold lined trays on this cart and then it is zippered shut to prevent cross contamination. How do you know when these donuts will be available?? They try to make these available every two weeks, but it is not guaranteed. My suggestion, call ahead and pre-order these. With over 50 customers pre-ordering each time they are available, they sell out quickly. Want to make a healthier version the maple bacon donut? Click here for my recipe! I could really go for that sweet and salty donut with bacon. OMG I’m not going to be able to stop thinking about it! MUST HAVE VANILLLA BACON MAPLE DONUT!!! You are too funny Robyn 🙂 Maybe we could cook the bacon on the grill and top our own donuts?